The name Bob Marley is synonymous with reggae music. There are two new books being released that relates to the legend. One will give you a deeper understanding into the history of the man and his music. The other is from one of his children that uses the "one love" of Marley Coffee to create some truly exceptional dishes with a new cookbook. The first book being published on September 1st is titled "Bob Marley And The Wailers: The Ultimate Illustrated History." It covers the entire history of Bob Marley, beginning with his poor upbringings in Jamaica. The chapters continue to dive deeper into his musical development with Bunny Livingston and Peter Tosh as The Wailers were created and released their first local hit single, "Simmer Down" in 1964. The book gives insight into the development of the group's sound with Marley becoming the lead figure of the band. All 13 of Bob Marley And The Wailers' albums are covered extensively with their own write-up, separate from the story of his rise to international stardom. The book goes on to include the turmoil within the band between Marley, Livingston and Tosh as Marley was heading into a more Americanized reggae sound, which made him into one of the biggest names in music during the seventies. The book also sheds light onto Marley's political agenda of one world united by love, which was not an easy task. He would use his music to empower the less fortunate and give hope for unity. Most of the stories center around the session work that went into his albums and also follows the solo work of Peter Tosh and Bunny Livingston, as Tosh became another international music star. The final chapters deal with Marley's untimely illness and death and the amazing legacy that continues to this day. This new hardcover release features over 300 photos, images, illustrations and memorabilia. Author Richie Unterberger has made this book into the authoritative history of one of the greatest musical artists of all time, Bob Marley. 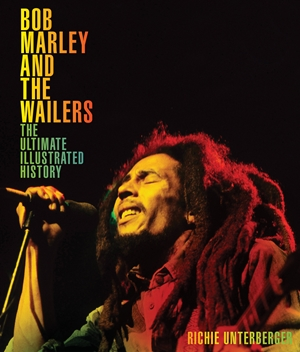 To find out more about "Bob Marley And The Wailers: The Ultimate Illustrated History," please visit quartoknows.com. The second book is a cookbook that was recently published by Bob Marley's son, Rohan Marley. 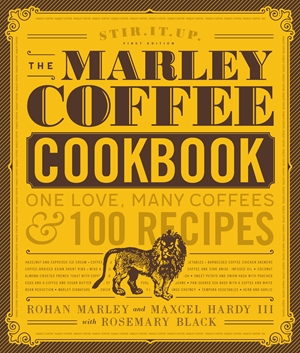 It features 100 recipes that include the Marley name brand of coffee as a key ingredient. Rohan Marley, along with fellow chef Maxcel Hardy III and food editor Rosemary Black, have created some unique ways to use Marley Coffee in everything from honey-glazed chicken to curry & coffee-braised lamb. The short introduction gives you a little background into who Rohan Marley is and how he came to fall in love with creating amazing dishes. The book is divided up into chapters that cover breakfast, lunch, dinner, dessert and everything in-between. The beautiful full color pictures of almost every dish or treat will inspire you to create these wonderful dishes using the many different blends of Marley Coffee. With step-by-step instructions, you will be wowing your spouse, family and friends in no time. Each chapter begins with a slight background about being a coffee farmer and what Marley's family meals were like growing up in Jamaica. A little imagination, love and faith is all you need to create these iconic dishes. To find out more about "The Marley Coffee Cookbook," please visit quartoknows.com.